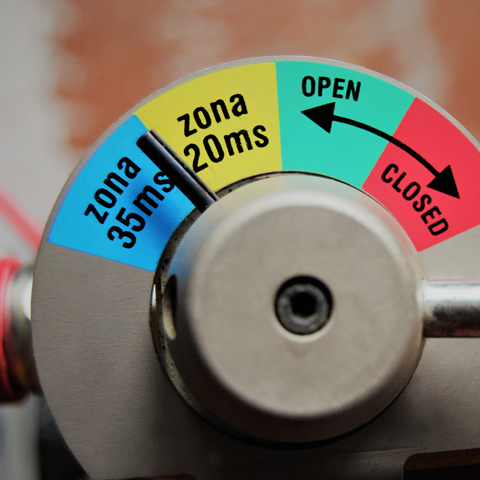 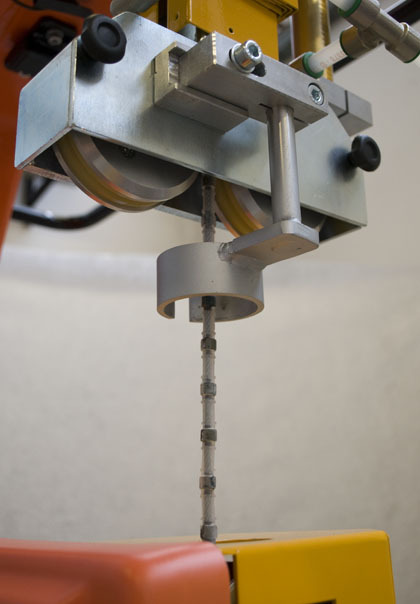 **Cutting speed depends on the type of material, the cutting height and the diamond wire employed. 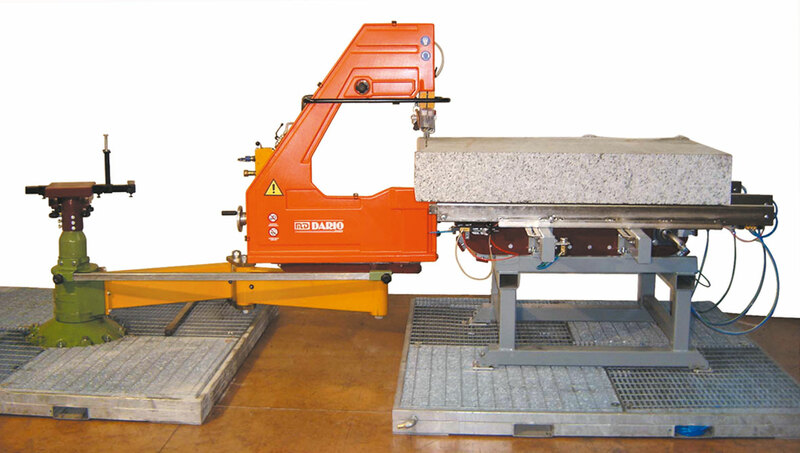 Platform 200 x 200 cm – The platform 200 x 200 cm ensures a bigger working area. 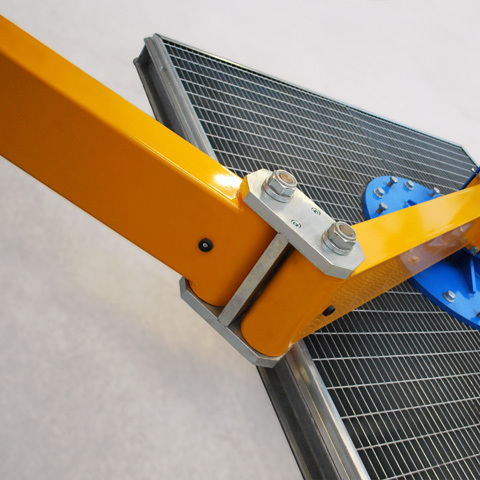 The use of grid platform guarantees the water drainage and a higher stability and safety for the operator.This kind of platform can be moved using a forklift, but not a pallet truck.Upon request, MD DARIO can supply also the tank for water drainage model AQ-090, to use in combination with water recycling devices. 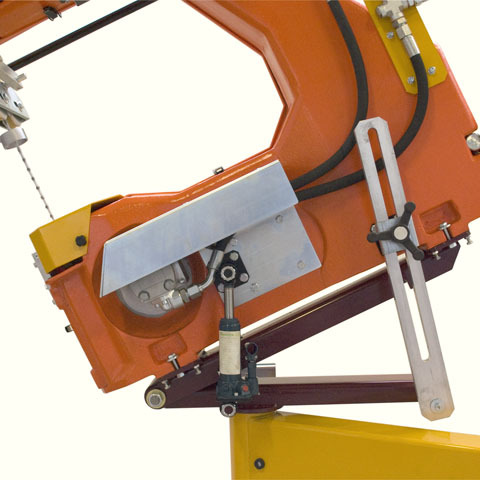 Extended articulated arm –The extended articulated arm BS600EX, reaching an extension of 165 cm allows to cut circular shapes with a maximum radius of 143 cm.The length of the articulated arm can be customized, according to the dimensions of the piece to work. 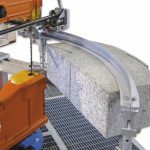 Extra column – It is possible to add to SET400 an extra column, to fix the piece to cut and realize arcs and shapes working on both sides, without moving the piece. 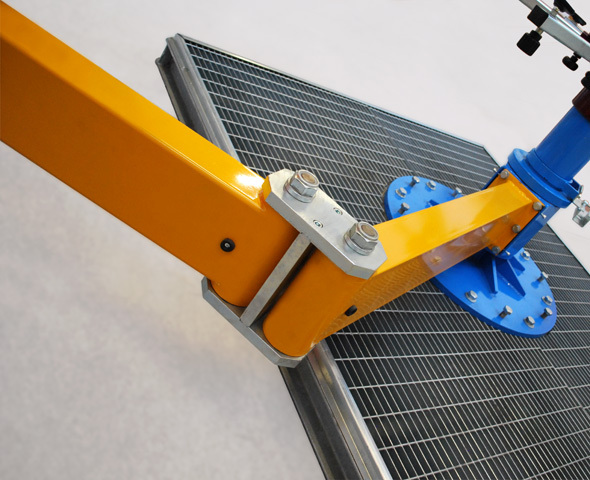 MD DARIO® suggests the combined use of the grid platform 300 x 200 cm. 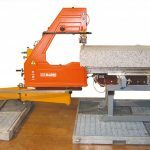 Automatic Arc Cutting Device – The automatic arc cutting device allows the automatic advance of the saw STM400. 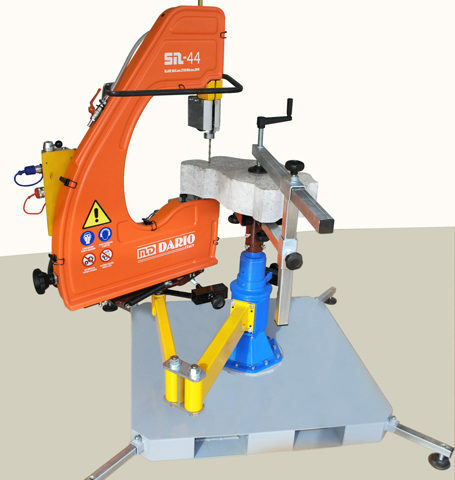 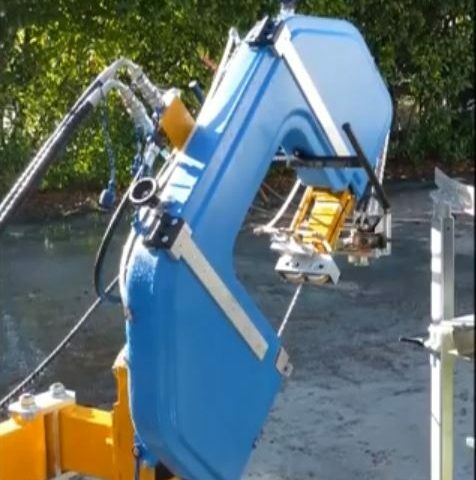 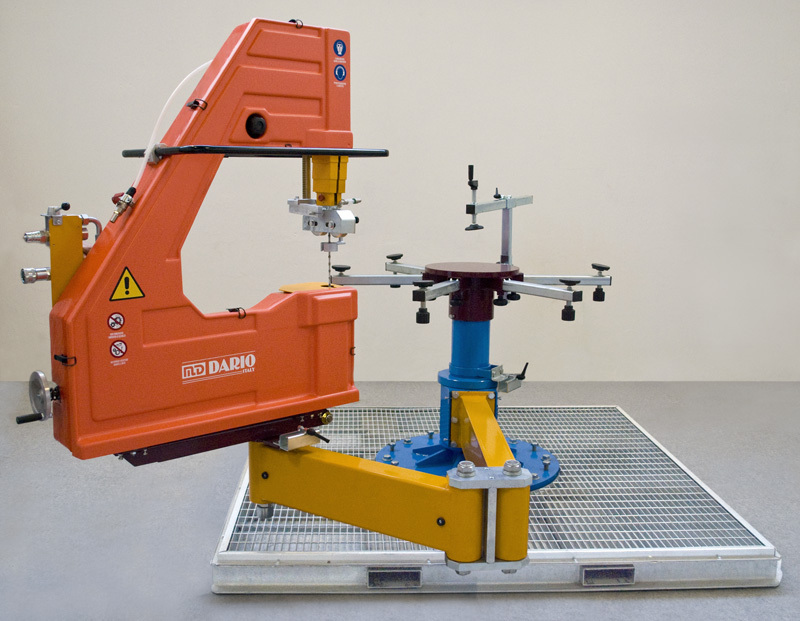 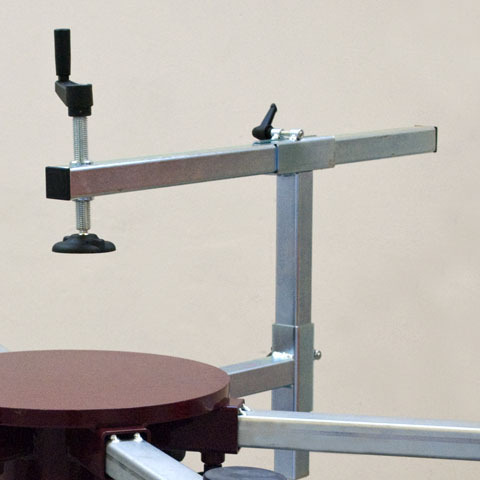 This device involves the use of arc templates (available in different radius) and it is suggested for those who need to cut several pieces in series (for example street curbs).The saw automatically follows the template and the operator is needed just to remove the piece that has been cut. 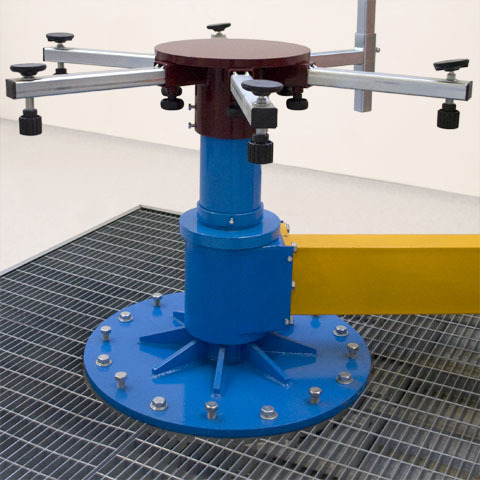 Material Advance Support with Anti-fall device – This special device has been realized to hold up pieces of marble or granite with big dimensions or difficult to move. 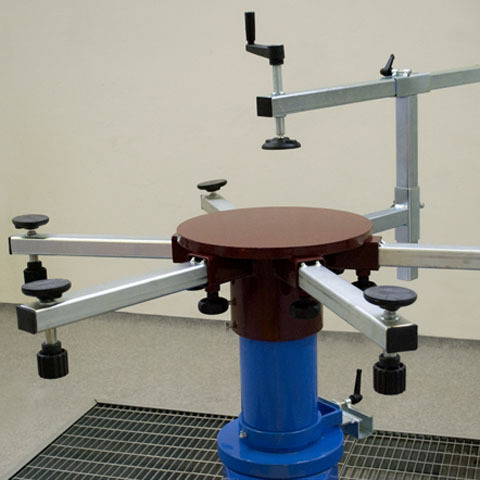 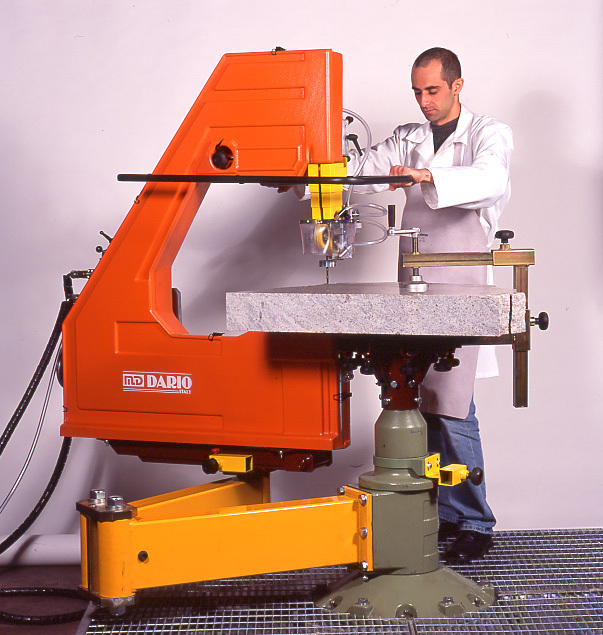 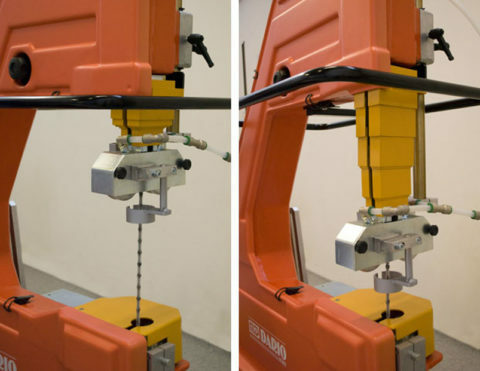 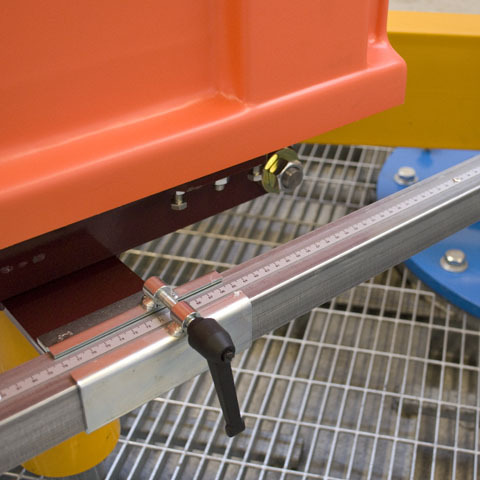 Once the block to cut is placed on the support and the machine advances, steel bars are activated in order to hold up the piece that has been cut, preventing it to fall (anti-fall device).Once the pieces have been removed, the bars will pull back again and a special mechanical device allows a new piece to advance and be cut. 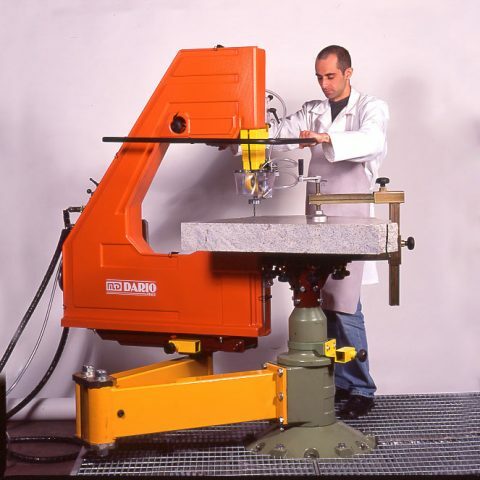 Every MD DARIO® marble/granite set is supplied with the hydraulic motor, allowing the operator to use water in complete safety. 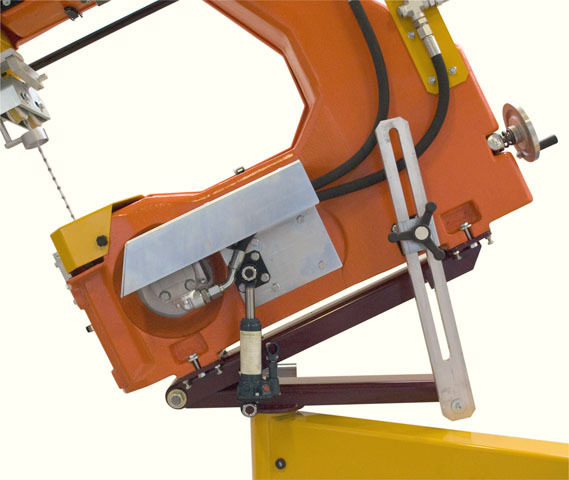 With the tilting device SR700M it is possible to tilt 45° the saw. 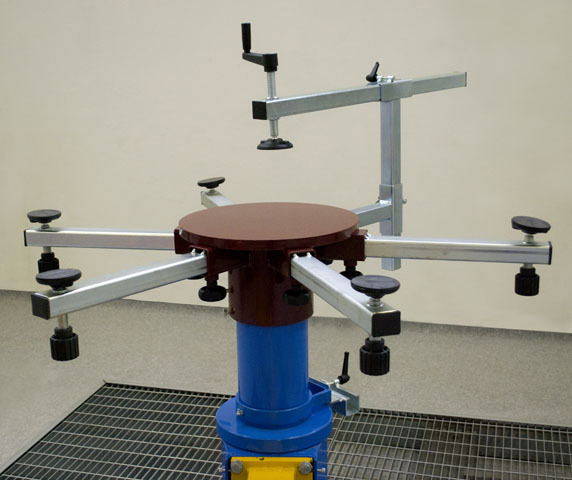 The regulation can be easily make through a grade hand wheel adjuster. 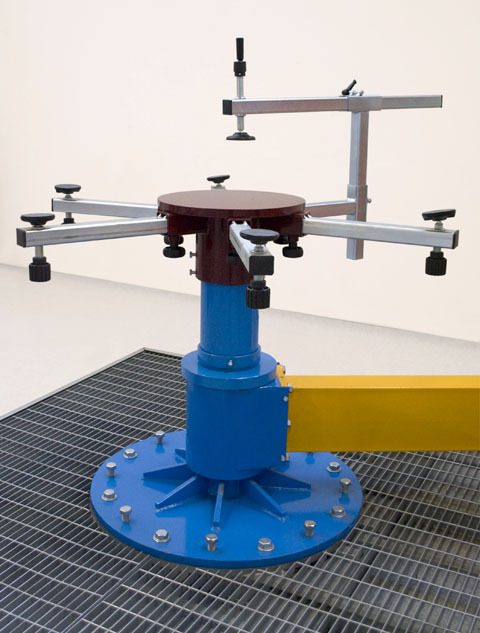 It must be considered that to higher inclination corresponds a lower side light.Watch the video of the device. 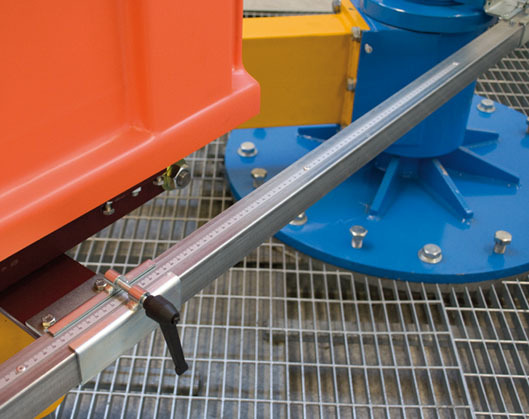 A lever, connected to the hydraulic motor, allows the speed regulation of the diamond wire. 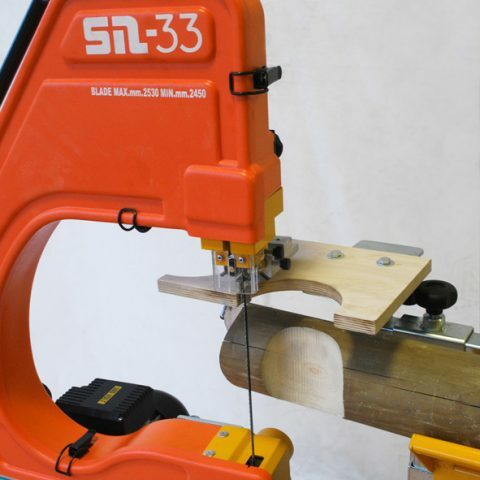 In this way, it is possible to cut different materials with the proper speed. 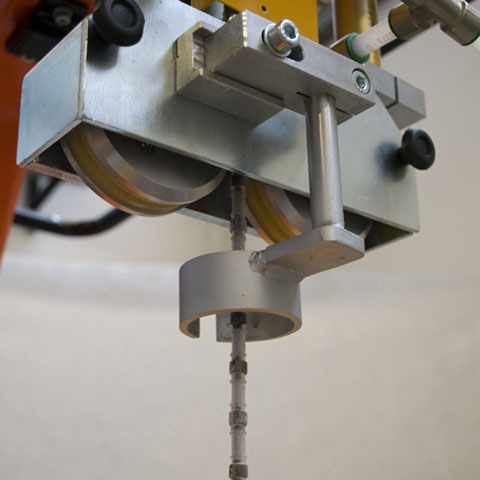 The material support made of tubes that can be added or removed from the structure, enables to put on materials of different dimensions.